A sombre mood engulfed Eldoret town on Wednesday as the hearse carrying the body of the late former 400m hurdles world champion Nicholas Bett snaked its way through the town. 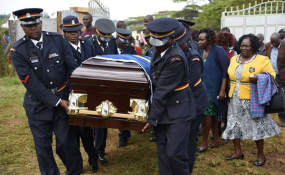 The body left Eldoret Hospital mortuary at noon and was escorted by family, friends, colleagues from the National Police Service and the entire athletic community to his final resting place in Simat village, Uasin Gishu County. Residents turned up in large numbers to pay their last respects to the fallen hero along the streets. Kapseret Member of Parliament Oscar Sudi was among leaders from the region who arrived at the mortuary to pay his last respects to Bett.